Imagine all you will see as you sail in a glass bottom boat, and visit the famous Arc, the sea lions colony, the natural rock formation and cross from the Sea of Cortez to the Pacific Ocean. Next begins your tour by land. We will go to the Finisterra Hotel located at the tip of the Baja peninsula and overlooking the town of Cabo, the Sea of Cortez to the east and the Pacific Ocean to the west. Enjoy fantastic views of the bay and the seascape. We will go to Cabo San Lucas downtown showing the principal places, and then to the blown glass factory. Stop at Palmilla viewpoint to admire San Jose bay, as well as Acapulquito Beach, known as a beach for surf lovers. Next we'll go to San Jose directly to the main church, the principal plaza and its houses that are from the middle of the 19th century. They are now restaurants and stores but have retained their original architecture. 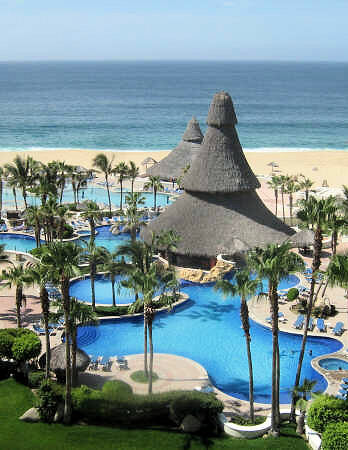 As we return to Cabo San Lucas, we'll pass the coast zone and the hotels from San Jose. Children ages five (5)and up require a ticket. Be sure to bring your camera. Child's rate is available for children 4 to 7 years old. Children age 8 and over pay the adult rate. Children under 4 not permitted.